On September 8, 1999, just a few weeks after promoting the head of the country’s top intelligence agency to the post of prime minister, Russian President Boris Yeltsin took a phone call from a world leader with whom he had developed an unusually close relationship: U.S. President Bill Clinton. “I would like to tell you about him so you will know what kind of man he is,” Yeltsin told Clinton. “I found out he is a solid man who is kept well abreast of various subjects under his purview. At the same time, he is thorough and strong, very sociable. And he can easily have good relations and contact with people who are his partners. I am sure you will find him to be a highly qualified partner,” he told Clinton. “Putin, of course. He will be the successor to Boris Yeltsin. He’s a democrat, and he knows the West,” Yeltsin said, speaking of himself in the third person. Yeltsin went on to resign the next month on New Year’s Eve. Putin won the March election, on his way to becoming Russia’s preeminent leader, and the longest serving leader of the country since Josef Stalin. The transcript of the conversation between Yeltsin and Clinton was included in hundreds of pages of memos and other documents quietly published online last month by Clinton’s official Presidential Library, in Little Rock, Arkansas. The declassified documents don’t provide major new revelations into the dynamics between the two countries’ relations after the 1991 Soviet collapse. But they do offer a window into a famously chummy relationship that was dubbed “Bill and Boris” by many observers at the time. On both a personal level and a bilateral strategic level, the papers stand in jarring contrast to the current state of U.S.-Russian relations, which have plummeted to levels not seen since the Cold War, before either Clinton or Yeltsin was president. The nearly 1,000 pages of declassified documents run from 1993 to 1999, during which both presidents won reelection in the same year, 1996. During that time, the two developed what some observers have said was the closest personal relationship any Russian and U.S. leaders have ever had. They reveal how Yeltsin, known as a vehement anti-communist, feared that the Communist Party could make a return to power — something that nearly happened during the 1996 presidential campaign. During a Kremlin luncheon on April 21, 1996, while Clinton was visiting Moscow, the two discussed the upcoming Russian vote, with Yeltsin giving a stark warning. “There are two paths for Russia’s development. I do not need power. But when I felt the threat of communism, I decided that I had to run. We will prevent it,” he added. Later in the conversation, Clinton responds in support. In 1995, the NATO alliance was discussing whether to expand eastward and admit several former Soviet bloc states as members. With their military greatly weakened by the Soviet collapse, the Russians were worried about NATO’s real intentions. Many Russian officials also began to question informal assurances they said had existed under Soviet leader Mikhail Gorbachev, that the alliance would not move eastward. 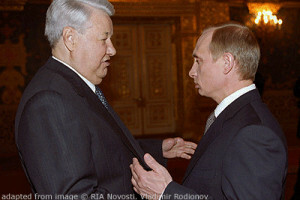 Yeltsin voiced that concern in a May 1995 meeting at the Kremlin. Clinton offers several explanations to Yeltsin, and also flatters Russia’s history, but Yeltsin doesn’t appear convinced. “I’ve made it clear I’ll do nothing to accelerate NATO. I’m trying to give you now, in this conversation, the reassurance you need. But we need to be careful that neither of us appears to capitulate,” Clinton said. In 1997, the alliance invited Hungary, Poland, and the Czech Republic to join. The mistrust deepened in June 1998, as open fighting erupted between Kosovar Albanians in Kosovo — which at the time was still part of what was left of Yugoslavia — and federal Serbian forces. Russia remained a stalwart ally of Serbia, and continued to back its strongman leader Slobodan Milosevic. In Washington and other European capitals, fears of another bloodbath, like what happened in the Bosnia wars just a few years earlier, were growing. Clinton and Yeltsin held a more contentious conversation about how to resolve the crisis. Clinton, meanwhile, tried to persuade Yeltsin to work jointly on a United Nations resolution condemning the Serbian crackdown, but he also left open the possibility for Western intervention. In March 1999, however, amid reported ethnic cleansing that drove thousands of Albanians out of Kosovo, NATO intervened and bombed Serb forces in Kosovo and Serbia itself. The intervention infuriated the Kremlin, and then-Prime Minister Yevgeny Primakov turned his plane around midair as it flew to the United States for urgent talks on Kosovo after being notified by then-Vice President Al Gore that the bombing was beginning. The bombardment sent bilateral relations to their nadir. To this day, it remains an open sore for many Russians, who saw it as yet another indication that, despite the warm relationship between the two presidents, Washington had nothing but disrespect for Moscow. As his presidency went on, Yeltsin’s health declined noticeably, particularly as his drinking increased. Yeltsin seemed to be drunk at several public events alongside Clinton, including press conferences. The newly released memos confirm one long-held rumor about Yeltsin’s talks with Clinton: On June 10, 1999, just days after NATO halted the bombing of Kosovo, the two leaders talked on the phone. Yeltsin proposed the two hold a one-on-one meeting on a ship, or even a submarine. According to some U.S. press reports, Yeltsin was audibly drunk on the phone. During the April 1996 luncheon, Clinton commented on Yeltsin’s health. “I noticed that you’ve gotten thinner. But you need to eat something,” Clinton said. Besides highlighting the extraordinarily cordial relations between the two presidents, Andrew Weiss said these newly released memos also help to highlight the grievances that many Russians have felt going all the way back to the Soviet collapse — something the former Clinton staffer noted has been encouraged under Putin.